Full Description: HOUSE & LAND FOR SALE, KAMPOS This traditional stone house with land sits down a quiet little lane. 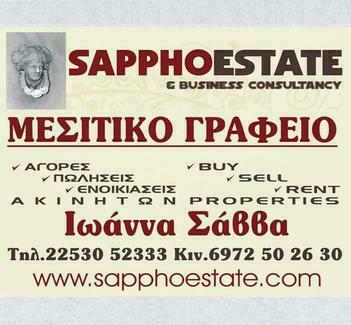 It is approx 2 km from Skala Eresoss and approx 3km to the village. Renovation work has begun but there's still some way to go. OK, so there's a long way to go! There is no bathroom, a very old kitchen and no floors to the rest of the house BUT there is a brand new roof. It's a small house and it may be possible to extend it, there's certainly enough land. The house itself is solid enough but this is definitely a renovation project. Seriously, it has the potential to be a quirky, traditional and original house. It's a very old kitchen with stone sink and recesses into the very thick walls. It does have a floor! A lovely, traditional, stone floor; the window looks out to the garden and beyond to the stunning mountain range. There are two further rooms which are reached by a beautiful stone arch from the kitchen, the owner has removed the wooden floorboards hence no floors! Both areas have large windows making the space light. I'm sure if I could see out of the windows (not possible at the moment) there'll be fantastic views across the land to the mountains. Double gates (more than wide enough to get a car through) lead to the house and attached land. It is fallow at present. There is a stone wall surrounding the entire property with chain link fencing on top of it making this a very secure space (think chickens, goats etc). There are some trees including olive, walnut, fig and almond. There's a concrete terrace to the front of the house with metal poles ready for a roof to be erected offering that much needed shade. There's also a natural spring well and an outdoor tap. There are lovely views from the front of the house. This listing has been viewed 16741 times.